Home › News › In the press › Offshore Industry, Volume 2 , Issue 6 , 2009. Offshore Industry, Volume 2 , Issue 6 , 2009. For well over thirty years, CT Systems has been supplying navigation and positioning products to the offshore industry. Most offshore work is carefully planned and often relies on a multitude of vessels depending on each other. Failure, or non-compliance, of a product on a single vessel can halt an entire offshore operation. As a result of the high quality demands for offshore equipment, CT Systems ensures that their products are of the highest possible grade. The products they manufacture and develop themselves, as well as the products supplied from third party manufacturers undergo rigorous testing before they are supplied to their customers. Systems supplied by CT Systems to offshore vessels consist of a multitude of equipment. For example, a basic installation consists of an industrial PC, multiple LCDs, advanced navigation software, and a DGPS receiver. As the installation relies on all parts of the system to flawlessly work together, every installation undergoes extensive testing before it is delivered to the customer. It is a fact that even the best products can fail. Malfunctioning can for instance be caused by lightning or electrical interference, by incorrect use or product fatigue. As no product is 100% failure-proof, essential offshore equipment is usually installed in a redundant setup. For example, CT Systems often installs (D)GPS receivers in a redundant setup, whereby two receivers are coupled to one navigation system. Based on the quality and position fix information in the GPS signal, the navigation system can automatically decide to use the backup GPS when the quality of the primary GPS drops below par, or fails completely. Along with online redundancy, much redundant equipment is also available offline. Simply meaning that whenever a part of a system is needed, the parts can be replaced by an on-site engineer with the use of a healthy supply of spares. In many cases there is plenty of opportunity to discuss the installation and wishes of the client, enabling the supplier to meet the demands of the crew and operators as well as possible. Compared to many other industries the offshore industry tends to be well planned. The supply of new equipment and installations will scarcely occur on a last moment base. Contrary to the supplying of new equipment, which tends to be well planned, replacement equipment and support can often be a last moment, and highly time critical endeavour. As a supplier of offshore equipment, being able to supply replacement equipment as soon as humanly possible is often seen in direct relation the quality of a product or installation itself. It also is an extent to the redundancy on board of a vessel. At all times CT Systems strives to keep a healthy stock of their entire product range. Doing so enables them to be able to replace equipment without having to rely on third party suppliers. This extra service is translated to their clients as off-site redundancy. As Offshore companies and vessels will expect from their supplier that they are available and able to provide support at all hours of the day, CT Systems keeps all contact channels open and a network of people available in case of an emergency. 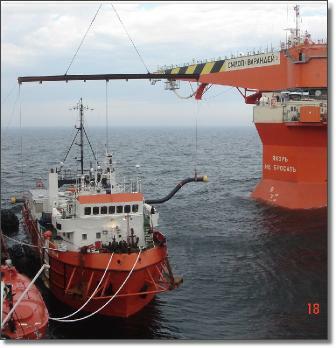 Through the years CT Systems has supplied a wide variety of equipment to a long list of offshore companies. There have been many large scale projects in which they have had their direct or indirect involvement. Along with this there are many long term contracts consisting of smaller offshore operations carried out by a single vessel or offshore company. to switch from the primary PC to the secondary within minutes. Thanks to the hot-swappable drive bays multiple copies of the entire software installation, along with all data can be made and stored on extra harddrives in a save storage place. GDF Suez is a large oil & gas company operating in the North Sea. GDF Suez does not operate its own fleet of offshore vessels, but instead works closely together with several fleet operators. CT Systems is in direct contact with GDF Suez, and makes sure that the vessel being contracted by GDF Suez is supplied with all necessary equipment needed for offshore positioning and navigation. A recent example is the offshore support vessel ‘Seamar Splendid’. This vessel was the first offshore vessel to be fitted with the all new version of CT Systems main software product ‘Viking Navigation’. A complete installation of PC, UPS, LCD’s, DGPS receiver and GPS compass were fitted, according to the demands of both GDF Suez and the ships owner. 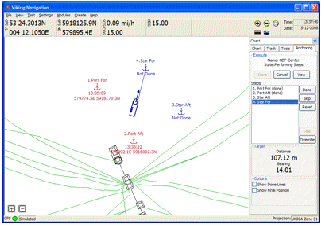 The new software package ‘Viking Navigation’ was soon joined by the special ‘Anchoring Module’. This module is a software extension to the Viking system itself, enabling the operator to plan and execute the exact positioning of the vessels anchors inside the safety zone of an offshore platform. Along with the supplying of navigation and positioning equipment for offshore vessels operated by GDF Suez, CT Systems has also supplied an offline version of their Viking software, which is installed on an office PC in the main office building of GDF Suez. This offline version is fitted with the exact same database of platforms, pipes, and obstacles as installed on the vessels. The two most prominent and well known projects of SMIT Salvage that CT Systems has supplied equipment for have been the wreck removal of both the car carrier ‘Tricolor’ and the semi submersible ‘Mighty Servant 3’. The equipment used for the salvage of the Tricolor had been specially fitted to the seagoing floating sheerlegs Taklift 4. This consisted of a centimetre accurate RTK GPS receiver placed on top of the massive boom of Taklift 4. This GPS receiver was connected to the Viking software displaying a detailed map of obstacles lying on the sea floor. 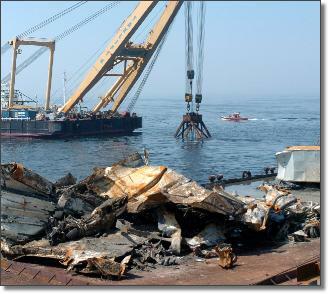 The combination of the RTK GPS and the detailed map of sub surface obstacles enabled the Taklift 4 to clean up the entire debris field created by the sunken Tricolor vessel. A more recent operation carried out by SMIT Salvage has been the salvage of the ‘Mighty Servant 3’, which had sunk off the coast of Angola. The support vessel ‘Smit Orca’ equipped with Viking software was used for both the positioning of the anchors of the Taklift 7 as for the Smit Orca itself. A quote from the captain of the Smit Orca; ‘Using the Viking software we were able to draw the position of the sunken vessel, and accordingly plan all anchoring handling and positioning of both vessels, in just 15 minutes!’. Innovative SoftwareCT Systems is an innovative company with more than 30 years of experience, and is highly experienced in every professional maritime sector. CT Systems saw its birth in 1976 and was founded in Hippolytushoef located nearby Den Helder, by its current owner Kees van der Vaart.The first customers were several oil and gas exploitation companies. Software and hardware was designed and consultancy was offered for clients and government agencies not just in the Netherlands, but also far beyond the outer frontiers of Europe.In the early eighties through accidental circumstances a microprocessor based computer had been designed, which was used initially as an interface and data processor in the offshore industry and was still for decennia in use as such. The nineties saw an increase of personnel and the addition of survey activities, topographic and bathymetric, specially written software for the dredging industry and more and more instrumentation control software. At the dawn of the new millennium, a major part of the activities consisted of contracts in Northern and middle Africa where, up to this day, CT Systems became active in land and water survey operations. With their well equipped workshop and ever growing software development team CT Systems is always on the lookout for new endeavours!